Congratulations Elsie! To claim your prize, please contact me with your full name and address by August 7, 2013. Please tell me if you would like a print or digital version of the book. Print book shipment to US addresses, or eBook internationally. Thanks to all who left comments, and for all those participating in the Regency Romance Reading Challenge 2013. It has been great fun. 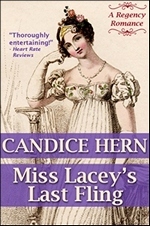 Our next review of “Lady Anne’s Excellent Adventure: A Regency Short Story,” will be on Wednesday, August 28th. I hope you can join us.